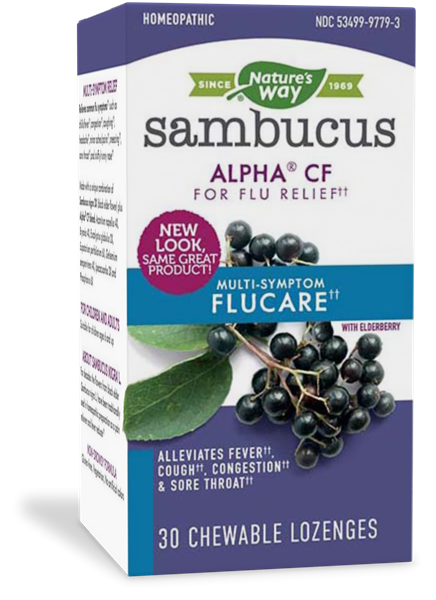 Sambucus FluCare Lozenge / 30 Lozenges - Nature's Way®. Chew or dissolve lozenges in the mouth. Do not swallow lozenges whole. For best results, use at the first sign of symptoms. Adults & children 12 years of age and older: Take 1 chewable lozenge four times daily. Children 6-11 years of age: Take 1 chewable lozenge two times daily. Ask a doctor before use if you have a persistent or chronic cough that lasts, is chronic such as occurs with smoking, asthma, chronic bronchitis, or emphysema or is accompanied by excessive phlegm (mucus).